Valencia, CA; January 15, 2019: Cicoil, the inventor of High Performance Flat Cables, now offers ultra-flexible Coaxial Cables for high speed data and video transmission applications. The low capacitance designs offer maximum signal integrity, low line to line skew and protection from extremely harsh environments. Cicoil’s standard 30 AWG Coax Cables are available in 50 Ohm and 75 Ohm versions with 1 to 8 coax conductors, and are excellent for use in Mil-Aero, Space, Medical, Marine and Commercial applications. Unlike industry standard Coax products, the Cicoil version has been designed for tight routing installation, continuous motion, phase stability, excessive heat (+329°F) and extremely cold bend temperature exposure (-85°F). The flame-resistant cables contain no halogens, offer space & weight savings advantages and provide unparalleled reliability in mission critical applications. Cicoil's one-of-a-kind extrusion process allows individually encased Coaxial Conductors to be placed in a small flat profile, precisely controlling the spacing of each coax, insulation thickness and the overall cable shape. 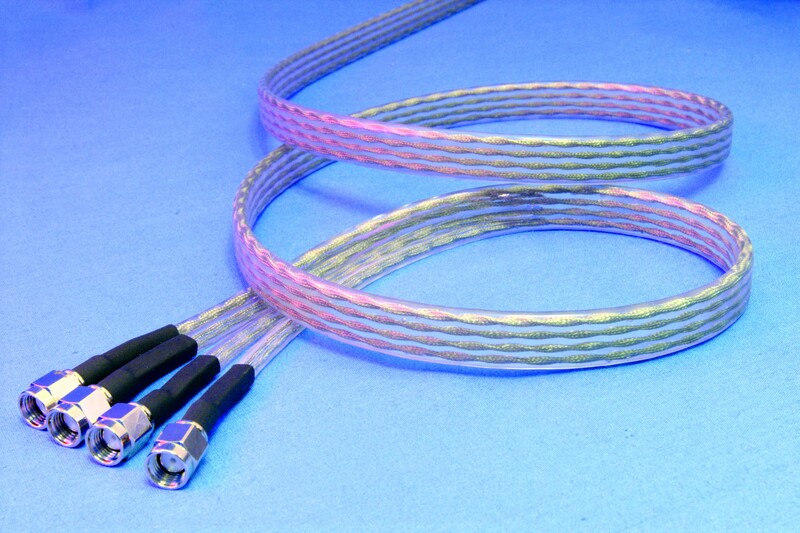 The durable Coaxial cables are self-healing from small punctures and will not wear, crack or deform during a lifetime of more than 10 million flexing cycles or long term exposure to constant motion, kinking, vibration, corrosion, water, steam, shock, sunlight, radiation, operational stress, autoclave, humidity, ozone, UV light and many chemicals. The cables are available in continuous lengths, break-outs, custom formed shapes, cut to order, or as fully terminated assemblies. Custom designs and RG styles are also offered with minimum lead times. When a non-adhering jacket surface is desired, Cicoil offers its SlideRite™ and GlideRite™ low friction coating options by request. Cicoil's Ultra Flexible 50 OHM & 75 OHM Coaxial Cables are UL Recognized, CE Conforming, RoHS & REACH Compliant, Class 1 Clean Room Rated and are cured continuously, with no debris or material contamination in an automated, climate controlled environment.